Christopher Carelli: What should Yankees do with Nathan Eovaldi? 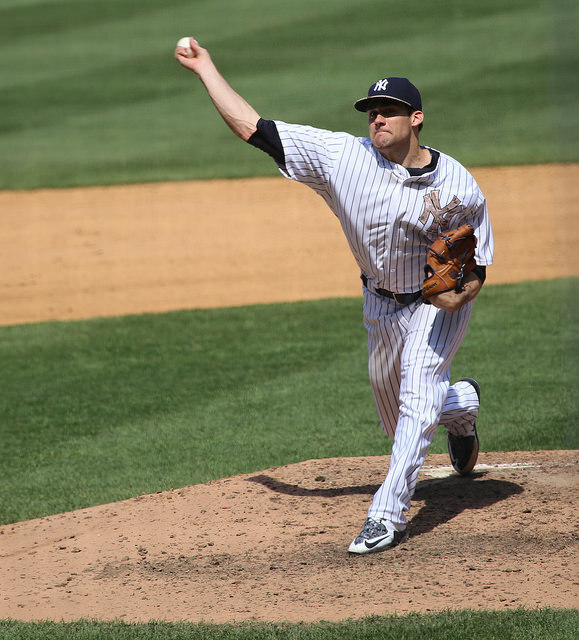 What should Yankees do with Nathan Eovaldi? When a pitcher gives up eight runs in less than an inning of work like New York Yankees starter Nathan Eovaldi did Tuesday night, it invokes some knee-jerk questions about his place in the rotation when the previous results were not exactly spectacular. The questions seem justified when there is speculation that another member of the rotation – one who has been better all season – is going to be leaving for the bullpen. What are the Yankees going to do with Eovaldi? My hunch is that they’ll stick with him in the rotation because it’s the easy thing to do and the Yankees might believe Tuesday’s implosion was a simple outlier. I was among those who jumped to suggest shipping him to the bullpen mostly because in my mind Adam Warren deserves better. Others stated that Eovaldi’s “stuff” fits the bullpen, which may be true on paper. The problem is the Yankees know Warren can pitch in the bullpen (and effectively so) while all they can discern about Eovaldi is that he has a tough time putting away batters with a 99-mph fastball. It’s baffling, but if Eovaldi can’t shutdown hitters as a starter in his first inning of work – he has allowed at least one run in the first inning in six of this 13 starts – he’s likely not going to do it as a reliever. Basically, the Yankees are forced to work through Eovaldi’s issues and hope that sometime, and soon, everything clicks. His slider has been more effective of late, but last night he left it up and it was hit often. Eovaldi is coming off a season in which he allowed more hits than any other Major League pitcher and he’s near the top of that list yet again (he stands fifth, just five hits shy of former Yankee Phil Hughes). Eovaldi has a lot of work to do and ironing his issues out in the bullpen might not be the best option. Speaking of options, Eovaldi has all of his as far as I can tell (per RosterResource). Maybe the Yankees send him down to the minors if this last start turns out to be the beginning of a bad trend? It couldn’t hurt and would give Warren the time he deserves as a starter, or provide Bryan Mitchell another crack at the big leagues to see if his success this season will translate at the next level. Now, if the Yankees are making deals and Eovaldi is someone the other team wants tossed in, I cannot see the Yankees holding back. They have some talent in the system (Mitchell, Luis Severino, Jose De Paula and Jaron Long are all in Triple-A) to withstand losing Eovaldi as far as future depth is concerned. It would be a tough call since they just traded for him, but it wouldn’t be shocking if the Yankees' brain-trust collectively felt Eovaldi is now what he’ll always be. For now, expect the Yankees to allow Eovaldi to prove Tuesday night was an aberration. However, if it marked the first wake-up call for the club, Eovaldi could be in for a change of scenery in the not-so-distant future.